He made a low-key appearance at a wedding in India last week but Tommy Hilfiger’s penchant for business had him scouring his Mumbai market as well. John Abraham may not know it yet but he may soon hit the jackpot what with Tommy Hilfiger commenting. “I think John Abraham is pretty cool,” in response to a question about which Indian celebrity he might consider as a brand ambassador. Hilfiger’s track record for spotting star potential is legendary – he cast Britney Spears and Beyonce Knowles as ambassadors for his perfume when they were unknowns. Abraham should, in all probability, be over the moon. Hilfiger’s reputation precedes him. His classic case of living the American dream came true. He began by selling bell-bottomed jeans out of the back of his car whilst in college. Today his brand logo (blue, white and red; a combination of the nautical flag, the French and the British flags) is a commonplace on campuses the world over. He heads a billionaire company, but admits to being more involved in the creative side of the conglomerate. “It’s more fun,” says Hilfiger; who was in India last week on a whistle stop tour – Mumbai for a dekko at how his store is doing, ditto for Bangalore and Delhi for a friend’s wedding (no he didn’t reveal who it is). “I came here primarily for the wedding but decided to mix a little business with pleasure,” says the irrepressible business magnate. Explaining his foray into India three years ago, he says, “I wanted to be the first international designer to come to India.” We are seated in his suite at the Hilton Towers overlooking the Arabian Sea. Below, luxury cars zoon down Mumbai’s newly paved roads. “India is changing very fast, much like Hong Kong. The luxury retail market is explosive here. Non-stop,” says the designer whose first visit to India was way back in 1978. But it was his meeting with Mohan Murjani that made his journey to India. “In the 80s, Mohan was known for his association with Gloria Vanderbilt jeans. When we met, he put forward the idea of coming to India. He thought it was the right time and along with his son Vijay, mapped out a whole plan for the brand,” explains Hilfiger, who now has stores in Mumbai, Bangalore, Chandigarh, Gurgaon, Hyderabad and Kolkata. Over the next five years, Hilfiger plans to open 50 more stores across India. Unlike most other brand bringers, Hilfiger does not view the lack of high streets as an obstacle to Mumbai’s luxury retail growth. “Where there’s fashion, people will come. Look at Linking Road, it’s quite amazing” trails off the designer, who visited the bustling suburb a day earlier. Clearly, the designer sees a method to Mumbai’s madness. 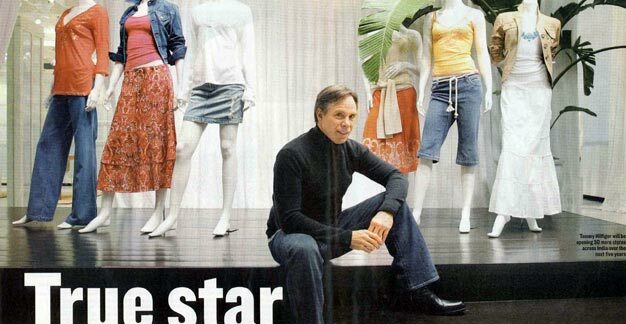 Indeed Hilfiger is known for channelizing his love for diverse culture, art, music and sport into his fashion, notwithstanding the alleged controversial racial remarks. Rock legend David Bowie, who in 2004 appeared along with his supermodel wife Iman for the launch advertising campaign of Hilfiger’s new spring collection, is said to have remarked, “I very much admire Tommy’s ability to weave so many influences into his work.” Hilfiger’s inspiration seems to come from places as diverse as Baja, near the Mexican border (check out his Spring/Summer 2007 sportswear collection), while the vibrant hues n many of his fashion clothing comes from his fascination with the colours of Rajasthan. “I love Indian embroidery and beadwork and especially the combination of colours the women of Rajasthan wear,” he says. It’s a fascination that has manifested in the form of the red stripes on a Tommy Hilfiger sweater or a bright yellow streak of colour on a Tommy Hilfiger bag or any of the designer’s watches, sportswear, sunglasses, jeans, socks, and footwear or home furnishings. Hilfiger admits that there is a lot of overlapping style that is incorporated in his clothing, accessories and furnishings. “I may use a buckle on a bag and a shoe, or a particular material on a piece of clothing and a bag. But I always wanted to build a global lifestyle brand,” says the designer, who recently agreed to stop using fur as trim for his products. A move that came after animal lover Pamela Anderson pointed out the horrors that into procuring fur. “Fur is very popular but I do care where it comes from. A lot of designers don’t and that’s sad but I didn’t want to use it anymore. I now use faux fur.” His sensitivity did not go unnoticed by Anderson who publicly acknowledged Hilfiger by pointing out that, “People who think that it’s just a little fur trim need to know that animals suffer tremendously for every piece of it.” Thanks, Tommy, for sticking up for the animals. But this is not a first for Hilfiger, who believes that influential people should lend a hand to support charities. “Everyone should do their bit, especially if you have the money.” And he seems to walk the talk, besides forming the Tommy Hilfiger Corporate Foundation in 1995 to help underprivileged youth, the designer also supports the Anti-Defamation league, the Washington D C Martin Luther King Jr. National Memorial Project Foundation, the Race to Erase Multiple Sclerosis and The One 4 All Foundation, a cause championed by Thierry Henry, who incidentally, Hilfiger has signed on a as a brand ambassador for his brand of men’s underwear. The deal seems to have worked for both the celebrity giants. “I really love the aesthetic, unique detailing that characterizes Tommy Hilfiger as a designer and am especially delighted that he will one of the sponsors supporting my foundation,” says Henry. In fact, Hilfiger has a penchant for joining forces with people he admires, another of whom happens to be designer Karl Lagerfeld, who in his opinion is “The king of design.” Consequently, Hilfiger bought the Karl Lagerfeld brand and is now the owner of the Lagerfeld Collection, which includes the collections and label of Karl Lagerfeld. But for all his association with high fashion priests and priestesses, Hilfiger admits that he is most comfortable in jeans. How many does he own? “Oh, around 50.” Not surprisingly, the only other brand he admits to wearing besides his own is Converse, a brand child of Levis. “I slip on an old pair every now and then,” says the designer with a grin. Evidently, his “never give up” mantra for work is applicable to his favourite pair of jeans to.